When you load Insights, you will see a dashboard, displaying your organization’s most crucial data over a personalized reporting period. Sections include an overview of your Engagement Score, Audience Size, Open Rate, Click-Thru Rate, and Personalization percentage. Since Cerkl was built to truly help increase audience engagement, we provide markers as to how your data measures up. Is your % Personalized metric yellow or red? No problem, we’ve got your back! Click Let’s Increase This to access tips and tricks to improve your stats. Open Rate green? That’s Awesome, Keep it Up, but let’s capitalize on this by clicking through to learn more, you’ll see ways other Cerkl partners have used their amazing metrics to drive even higher engagement rates. 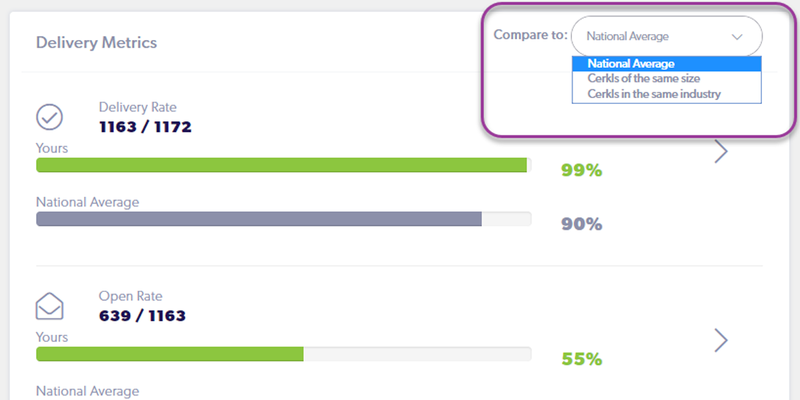 You even have the ability to compare your organization’s delivery metrics (Delivery Rate, Open Rate & Click-Thru Rate) against national averages, Cerkls of the same size or Cerkls in the same industry. This can provide you valuable insights into what your organization does well and places you have room to improve. 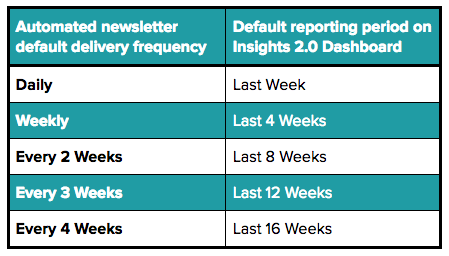 To change your comparative delivery metrics, select the dropdown menu in the top right hand corner of the Delivery Metrics component on your Dashboard. Your Dashboard is a static page that gives you a high level overview of your engagement performance. But this is just scratching the surface of what Insights has to offer you and your org. More of a visual learner? Watch the video below which quickly explains the Insights Dashboard.